Here we are going to see, "Scientific notation rules". 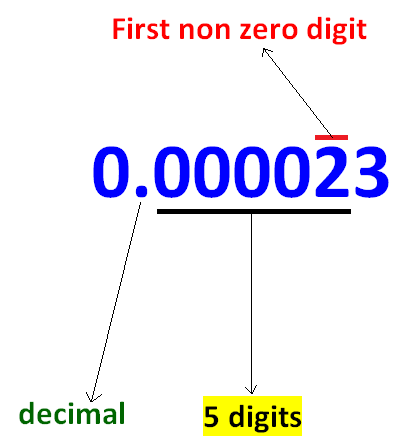 To convert the given number into scientific notation, first we have to identify where the decimal point and non zero digit come. To have better understanding, let us go through some practice questions on "Scientific notation rules". Write the given number in scientific notation. Here decimal point comes first at non zero digit comes next. We have to move the decimal point to the right. Let us look at the next problem on "Scientific notation rules". Here we don't find decimal point in 5400000. So we have to assume that there is decimal point at the end . Here non zero digit comes first and decimal point comes next. We have to move the decimal point to the left. Here decimal point comes first and non zero digit comes next. Here we don't find decimal point in 804 x 10² . So we have to assume that there is decimal point at the end . Here the given number is almost in scientific notation. Because there is only one non zero digit before the decimal point. We don't have to move the decimal point either to the left or right. Then, exponent of 10 should be zero. We have to move the decimal to the right. After having gone through the stuff and examples, we hope that the students would have understood "Scientific notation rules". Apart from the stuff and examples explained above, if you want to know more about "Scientific notation", please click here.